GR 3-2415). 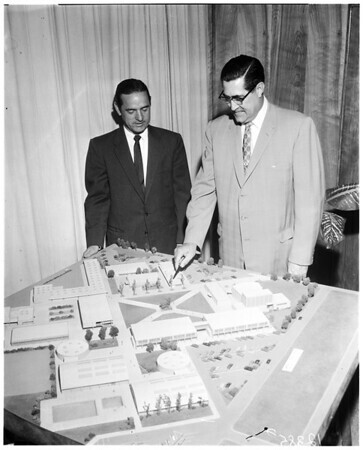 Campus model -- Centinela Valley Union High School District Superinendent [sic] Jefferson L. Garner, right, goes over a model of the new Lawndale High School. Groundbreaking ceremonies for the new educational plant were held Saturday at 2 p.m. With Dr. Garner is district board of trustees president Doug Robertson. The new $2,000,000 structure will be at Compton and Inglewood avenues, and will be ready for occupancy in the fall of 1959".